There is an epidemic that has been running rampant for decades, maybe even centuries. It doesn't discriminate, it doesn't judge, it doesn't care, and if we don't take action, it's going to get worse. The epidemic that we speak of ruins your golf game, destroys barbeques and slices your bare feet at the swimming pool. If you haven't already guessed it, we are talking about warm beer and broken bottles. We have the solution. We have the cure. On a warm but fateful summer day, we were sitting lazily on a beach with our Uncle Van. 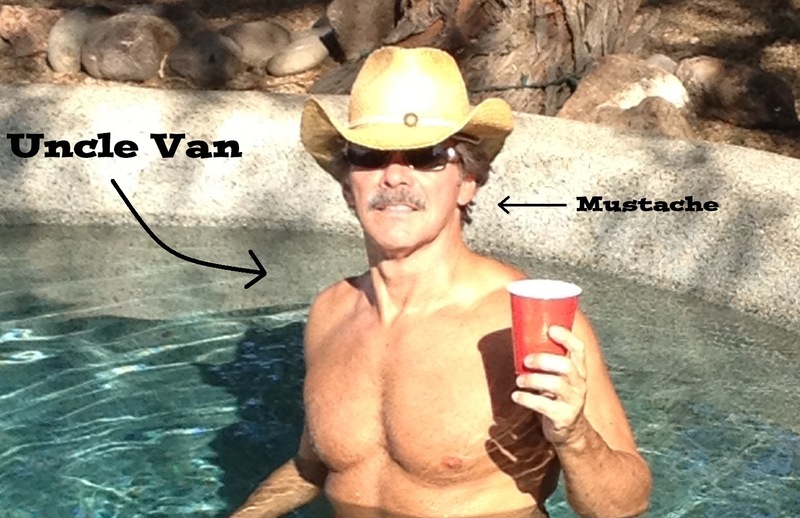 As Uncle Van’s beautifully full push-broom mustache was gently wavering in the sea breeze, we began complaining about the warm beer simmering in our ‘red solo cups’. There are few things that can kill your mood on a relaxing, warm summer day, but the taste of obnoxiously warm beer filling your mouth is absolutely one of them. This is not one of those problems that you come across every day, but when it occurs, it’s just devastating. As we pondered the depth of our predicament, a serious brainstorm began regarding potential solutions that would allow us to enjoy the cool refreshing taste of carbonated joy in a way that didn’t require us to slam the beer in 3 minutes or less…as much as you try, you just can’t slam them all. As illustrated below, BottleKeeper has a 1/4 inch thick neoprene sleeve that lines the walls of a stainless steel container that just so happens to keep the contents substantially colder than a standard beer “koozie”. It’s science. The result of this highly technic​al advance in scientific research is that your beer is kept colder, longer, and by the way, you don’t have to keep pretending that it’s not beer you’re drinking in that not so inconspicuous ‘red solo cup’…yet another problem solved. Oh look, BottleKeeper also protects that beer from it’s other arch-enemy, gravity. We would like you to join us and take the ever important step of acknowledging that you, too, do not enjoy broken bottles or warm beer (sorry England). We charge you, keeper of the funds, with the responsibility to help eliminate the warm beer and broken bottle epidemic by supporting BottleKeeper and sharing it with your friends. Don’t be selfish, it’s really a matter of safety. Let's be straight, BottleKeeper keeps beer cold anywhere that you would like to enjoy the legal delight of cold suds. It's even FAA safe and allowed on all domestic and international flights (although they don't serve bottles on planes, except those tiny liquor bottles, so we're not real sure what to do here, but you can still take it on a plane if you want). After taking charge of your enthusiastic future as a beer loving consumer, you can rest assured that every nickel raised in this campaign is going to be invested in our first manufacturing run. We are fully committed to you and to BottleKeeper. At this point, we have personally funded the creation and cost of the molds, so we're already very invested in completing this project. Now we ask you to get involved in changing the world by eliminating warm beer and broken bottles, once and for all. A Special Note; although we know you're a responsible adult, we're not condoning or recommending that you break the law by using BottleKeeper to drink a beer where you shouldn't. Just saying. In a matter of months we have successfully filed trademarks, a patent, created prototypes, performed preliminary heat transfer testing, created pertinent CAD/engineering drawings, performed substantial 'due diligence' to create a relationship with a stainless steel bottle manufacturer in China, ordered the molds for the first production run and compared Kickstarter to Fundable for a Crowdfunding platform...Fundable won. We have a functional landing page at TheBottleKeeper.com, where we have been successfully collecting emails for over two months and are beginning to secure 'pre-orders' with retailers across the country, with more significant volumes recently (50+ units). We're also actively growing a social media presence for BottleKeeper on both Facebook and Twitter. He's probably going to punch us both for saying this, but he has a rather "unique" personality. With the competition being a standard beer 'koozie' and a 'red solo cup', BottleKeeper is leaps and bounds ahead. Let's be honest, drinking beer out of a plastic cup is like surfing with a t-bone steak tied to your leg...it just doesn't make sense. As entrepreneurs, Adam and Matt have been involved in a number of startups, from medical device and health insurance reimbursement technology companies, to mobile applications and alternative fuel conversion systems for commercial vehicles at a national level. We have the combined experience that will allow BottleKeeper to take the cold beer epidemic by storm. Entrepreneur and enthusiastic beer lover. Matt is the Co-Founder of CamCal Enteprises, LLC, the parent company of BottleKeeper. Matt is also the Co-Founder and COO of Campbell-Parnell, a company that specializes in the distribution and installation of EPA-certified LPG and CNG conversion systems to corporate and government fleets across the United States. Raised in Phoenix, Arizona, Matt studied at the University of Arizona where he earned both his undergraduate degree, a Bachelor of Science in Molecular and Cellular Biology with a variety of minors, and his graduate degree, a Masters of Business Administration. Matt continues to live in Phoenix, Arizona. I believe that all beer has the right to remain cold. I intend to protect that right. I love beer. And America. Strategic entrepreneur and admitted beer digester. Adam is the Co-Founder of CamCal Enterprises, LLC, the parent company of BottleKeeper. Additionally, Adam is the Founder and CEO of PiCK Ventures, Inc., the parent company of PiCK, a mobile wine technology company. Previously, Adam was a Partner and Vice President at a health insurance reimbursement technology company that quickly grew to stand as the largest out-of-network health insurance reimbursement company in the U.S. Born and raised in Flagstaff, Arizona, Adam studied at the University of Arizona where he also earned a Bachelor of Science degree in Molecular and Cellular Biology with a variety of minors. Adam and his wife Katie now live in Manhattan Beach, California. Every dollar helps, especially when it comes to cold beer. Thank you! A BottleKeeper of your very own! BottleKeeper time! BottleKeeper will sell on our site for $19.99 plus shipping when completed. But you're special so we want to thank you with a BottleKeeper of your very own from the first production run! US Shipping is on us too! A Special Edition BottleKeeper coming your way! You will receive a BottleKeeper from the first production run that is engraved along the bottom edge with a serial number indicating your true level of specialness, only 500 will be made...US Shipping on us. His and Hers! With retail value of nearly $40, you'll be rewarded with a matching pair of BottleKeeper's for your efforts as a BottleKeeper supporter. Yet again, US Shipping is on us. Now we're talking! A pair of Special Edition BottleKeeper's coming your way with engraved serial numbers (only 500 made)! Oh yeah, and if you're in the US, we'll ship these bundles of joy to you at our expense. 6 Pack Time! You've stepped into the realm of a 6 Pack of BottleKeeper's for you and your friends, or heck, maybe just for you...maybe that's just how you roll! Retail value of almost $120! We're also going to include domestic shipping. You really must like BottleKeeper! Well, we like you too so we're going to reward you with 13 BottleKeeper's so you and a large group of your friends can, well, do what you and large groups of friends do...retail value of 13 pennies under $260 that will be shipped domestically on us!